In conjunction with its newly updated App Store software, TomTom announced it will release a car kit that will bring GPS functionality specifically to the iPod touch. The new TomTom car kit for iPod touch is compatible with both the first- and second-generation iPod touch, and requires iPhone OS 3.0 or later. The hardware will be "available shortly," the company announced this week. At $99.95, the hardware is $20 cheaper than the car kit for iPhone. According to a TomTom spokesperson, the car kit for iPhone has Bluetooth capabilities, while the iPod touch kit does not. In addition, the iPod touch kit is slightly smaller. 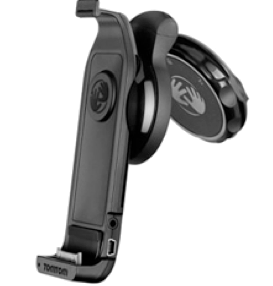 Secure docking: Award-winning EasyPort mount fixes your iPod touch. Built-in GPS receiver: The built-in GPS receiver turns your iPod touch into a mobile navigation device. Clear voice instructions: Built-in speaker allows users to hear instructions. Line out for music playback: Using the line out connector, users can play songs through a car's audio system with the optional audio cable. The system also fades music when giving directions. Rotates for optimal positioning: Rotate the screen for widescreen route display. And the kit folds flat, making it easier to move from car to car. Charges iPod touch while driving: Dock your iPod and have it charge as you drive. Earlier this week, TomTom updated its application on the App Store to version 1.2, adding support for the first-generation iPhone, as well as the iPod touch. Previously, the software could only be installed on the iPhone 3G and iPhone 3GS. Both the first-generation iPhone and the iPod touch require car kits, because the devices lack an integrated GPS receiver. The kit also boosts GPS reception with its external receiver for the iPhone 3G and iPhone 3GS. The iPhone car kit retails for $119.95.